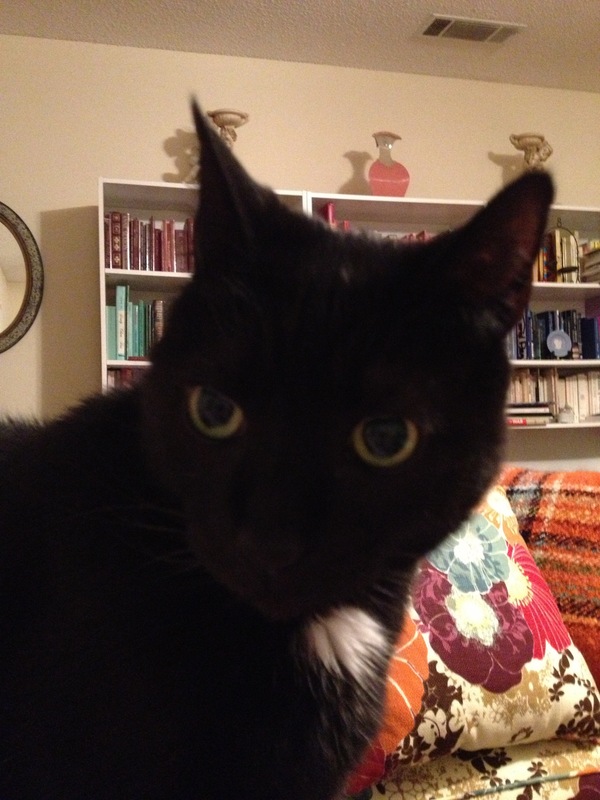 This is a picture of Gertrude Stein, taken as I type. She’s this close to my face. And singing. It’s a lot to deal with. Weather” aria, which is the saddest song in Gertrude Stein’s entire repertoire, besides the “You Didn’t Set You Alarm and I Realize You Want to Sleep In But Hey, Treats?” aria. However, it’s April. It’s National Poetry Month, and if poetry celebrates anything, it’s anything that’s cold and awful. Therefore, I’m making the best of the weather and looking for the best in today — and one of the best things is this announcement: I’m going to be on the radio tomorrow. No, really. Someone is actually going to let me talk on the radio without the FCC present. That someone is the wonderful and talented and generally amazing Katrina Murphy, who’s invited me to join her on her wonderful and talent-filled and generally amazing radio show, Questions That Bother Me So. The show will stream live tomorrow from 1:00 – 3:00 Eastern time (I think — Eastern time, right? Like the one that the East coast is on? Time zones are confusing and I can’t think about them too much because I start thinking about how time is just a construct and then I get confused). You can listen along here (go to “shows,” then “Questions That Bother Me So”), and I’ll be live-Tweeting the experience from my Twitter feed. There will also be a chat room. It’s going to be totally meta. Topics to be discussed may or may not include poetry, National Poetry Month, Maleficae, witches, witch trials, witch burnings, writing poetry about witch trials and burnings, cats, velociraptors, sloths, and more poetry. It’s going to be awesome. The last time I was on the radio, I had pink eye and a kidney stone, and I still managed not to drop an F-bomb, which was a major triumph, as you know if you’ve ever had a kidney stone or, like, been in a room with me. This time, I probably also have a kidney stone, but hey, no pink eye. Let the F-bombless awesome commence. And there are other exciting things afoot, so please keep your eyes on this small section of the Intertubes. In the meantime, here are some pictures of how I tried to make the best out of this gray and cold and awful day. 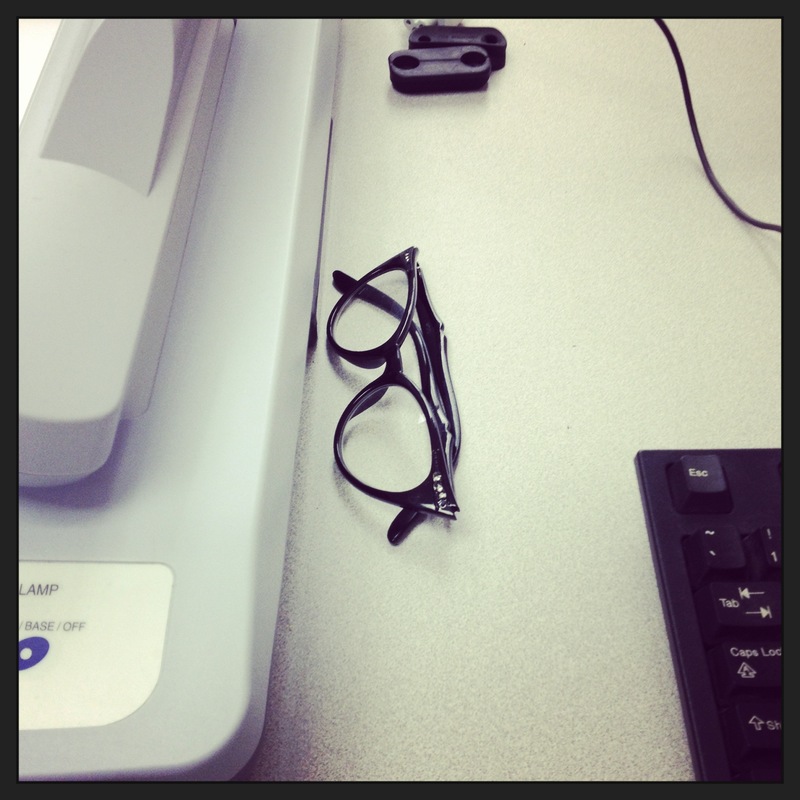 If there’s one thing I’m very good at, it’s losing my reading glasses. I had a gorgeous green pair that I left somewhere in the Charlotte airport, or possibly on an airplane. Or somehow in the sky. I still miss them. I was thrilled when I came into my classroom today and found that my glasses were still where I apparently left them on Tuesday. Rainy day triumph number ONE. Seriously, the weather today? TERRIBLE. I decided to make the best of it by making it into an exercise. 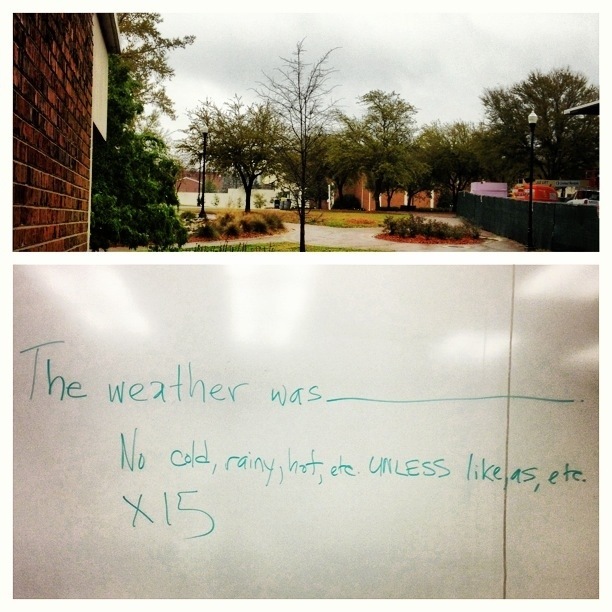 My students had to complete this sentence — “The weather was ____” — fifteen times. If they used weather words, like cold and rainy and awful, they had to use a simile. I did the exercise along with them and ended up with my poem for today. RAINY DAY TRIUMPH TWO. 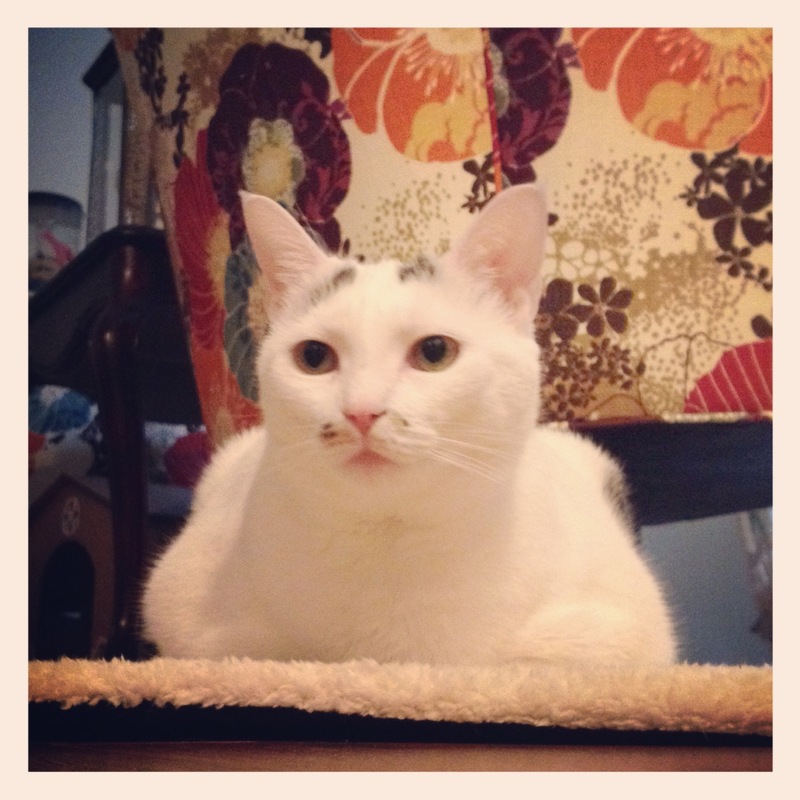 A few months ago, Alice took this Purr Pad out of a chair and pushed it across the room, right next to the front door. Today I found out why: she sits here to wait for me to get home from work. RAINY DAY TRIUMPH THREE. CUTENESS TRIUMPH INFINITY. 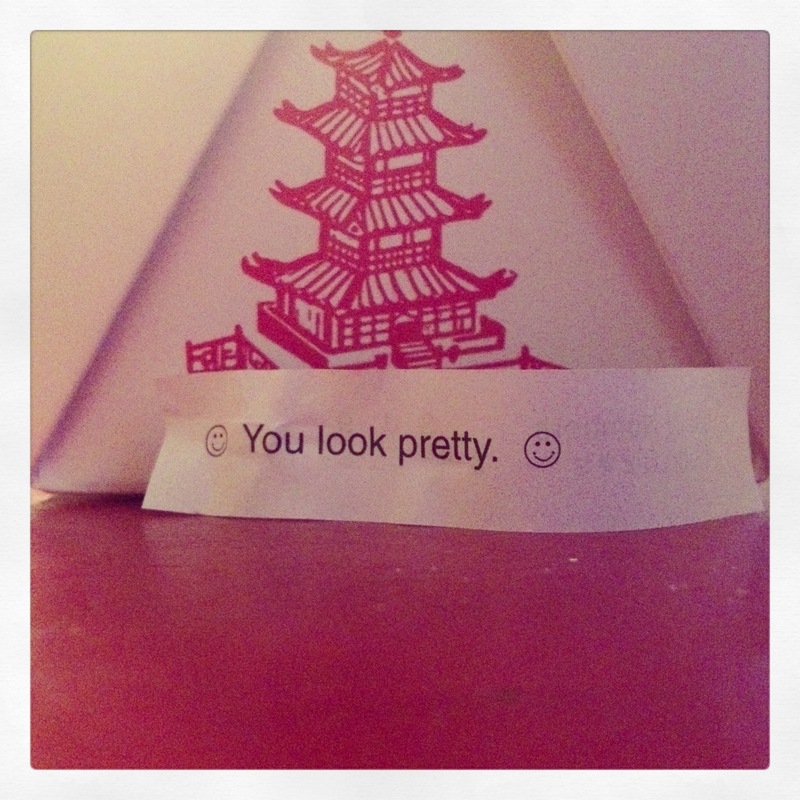 Chinese take-out once again proves it’s the best boyfriend ever. RAINY DAY TRIUMPH FOUR. Well, plus Chinese food in general, and food that’s delivered to the door, both of which are always triumphs. * Bonus points to anyone who catches the reference in this post’s title! On the radio, uh-oh, on the radio, uh-oh. ELEVENTY BONUS POINTS TO IVY ALVAREZ!! !